Sunday week [15 February 2015], is the Sunday before Lent. The readings in the Revised Common Lectionary (RCL) for that Sunday are: II Kings 2: 1-12; Psalm 50: 1-6; II Corinthians 4: 3-6; and Mark 9: 2-9. There is an alternative set of readings: I Samuel 3: 1-10 [11-20]; Psalm 139: 1-5, 12-18; II Corinthians 4: 5-12; and Mark 2: 23 to 3: 6. In the New Testament reading (II Corinthians 4: 5-12), Saint Paul talks about the minds of unbelievers being blinded, while our eyes should be focussed on the light of the Gospel, which is the glory of Christ, who is the image of God (verse 4), and of light shining out of darkness (verse 6). The Synoptic accounts of the Transfiguration are very similar in wording [Handout supplied]. All three accounts tell us that Christ’s robes become dazzling white, but Saint Mark alone tells us they are a white “such as no one on earth could bleach them” (verse 3). 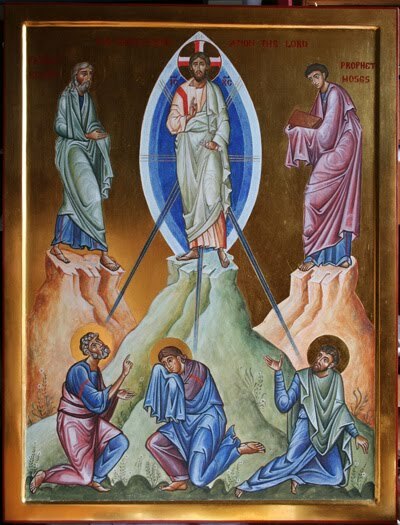 Should we describe the Transfiguration as a miracle? If we do, then it is the only Gospel miracle that happens to Christ himself. On the other hand, Saint Thomas Aquinas spoke of the Transfiguration as “the greatest miracle,” because it complemented Baptism and showed the perfection of life in Heaven. None of the Gospel accounts identifies the “high mountain” by name. The earliest identification of the mountain as Mount Tabor was by Jerome in the late fourth century. But does it matter where the location is? As for the cloud, all three Synoptic Gospels describe the cloud’s descent in terms of overshadowing (επισκιαζειν, episkiazein), which in the Greek is a pun on the word tent (σκηνάς, skenas). But this is also the same word used to describe the Holy Spirit overshadowing the Virgin Mary at the Annunciation: καὶ δύναμις ὑψίστου ἐπισκιάσει σοι (Luke 1: 35). ● God the Father speaks from heaven: “This is my Son, the Beloved; with him I am well pleased; listen to him” (Matthew 17: 5). In this sense, the Transfiguration is also considered the “Small Epiphany” – the “Great Epiphany” being the Baptism of Christ, when the Holy Trinity appears in a similar pattern). Moses and Elijah show that the Law and the Prophets point to the coming of Christ, and their recognition of and conversation with Christ symbolise how he fulfils “the law and the prophets” (Matthew 5: 17-19). Moses and Elijah also stand for the living and dead, for Moses dies and his burial place is known, while Elijah is taken alive into heaven in order to appear again to announce the time of God’s salvation. In some ways, Saint Peter, Saint James and Saint John serve as an inner circle or a “kitchen cabinet” in the Gospels. Perhaps this intimacy is reflected in the fact that they are the only disciples who are given nickname by Christ: Simon becomes the Rock, and James and John are the sons of thunder (Luke 5: 10). The Transfiguration reveals Christ’s identity as the Son of God. In the Gospel, after the voice speaks, Elijah and Moses have disappeared, and Christ and the three head down the mountain. The three ask themselves what he means by “risen from the dead” (Mark 9: 9-10). When they ask Christ about Elijah, he responds: “Elijah is indeed coming and will restore all things; but I tell you that Elijah has already come …” (Mark 9: 12-13). He tells them to keep these things a secret until the Son of Man has risen from the dead. Yet, in keeping with the Messianic secret, he tells the three not to tell others what they have seen until he has risen on the third day after his death. ● The “Icon of Christ Not Made by Hands” (16 August). The Transfiguration is both an event and a process. 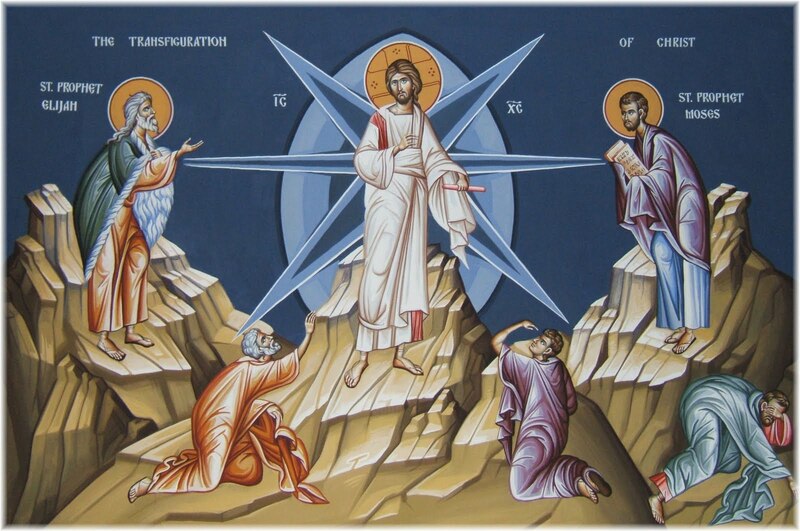 The original Greek word for Transfiguration in the Gospel accounts is μεταμόρφωσις (metamorphosis), which gives us access to a deeper and more theological meaning, a deeper truth, than the word derived from the Latin transfiguratio, which can be translated by “to be changed into another from.” But the Greek μεταμόρφωσις means “to progress from one state of being to another.” Consider the metamorphosis of the chrysalis into the butterfly. The Transfiguration points to Christ’s great and glorious Second Coming and the fulfilment of the Kingdom of God, when all of creation will be transfigured and filled with light. The vision of Christ in his glory and the experience of the divine light are at the very heart of both Orthodox mysticism and Orthodox eschatology. The “uncreated light” is a hallmark theme in Orthodox spirituality, especially in the writings of Saint Gregory Palamas and the school of the thought that is hesychasm, which draws constantly on the themes of the Transfiguration. The incarnation is a new beginning for the human race, and in the Transfiguration we see not only our human nature at the beginning, but as it can be in and through Christ at the end, he told the Summer School organised that year by the Institute for Orthodox Christian Studies in Sidney Sussex College. He also referred to Revelation 21: 5, where Christ tells the Seer of Patmos: “Behold, I make all things new” – not: “Behold, I make all new things.” The Transfiguration is a pre-figuration of the transfiguration of the cosmos, he said. In Christ dwells all the fullness of the Godhead. But at other points in his life, the glory is hidden beneath the veil of his flesh. What we see in Christ on Mount Tabor is human nature, our human nature, taken up into God and filled with the light of God. “So this should be our attitude to the secular world,” Metropolitan Kallistos said. Look at verse 9. Is there an appropriate time for mission an inappropriate time? (Revd Canon Professor) Patrick Comerford is Lecturer in Anglicanism, Liturgy and Church History, the Church of Ireland Theological Institute. This essay is based on notes prepared for a Bible study in a tutorial group with MTh students on 4 February 2015.